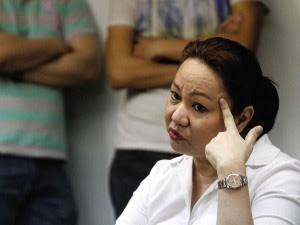 In The Eyes Of The Beholder: Good New: Napoles Surrendered! LOL! She looked like she's getting ready to shoot herself! "Last night at 9:37pm (Philippine Time), the said to be “mastermind” behind the Pork Barrel Scam – Janet Lim-Napoles, surrendered to the President." I got the news from our manager at work last night. She sent an email to everyone at the office about it. Then all of a sudden, the office is filled with gasps. Everyone seemed pleased with the news. Finally, one of the biggest thieves surrendered! This is just the beginning of what everyone expect will happen. It’s like watching a teleserye (t.v. series). The audience are the Filipino people waiting for the next series to happen. Since Napoles in now in custody, all Filipinos are ready to hear her “talk”! So let’s brace ourselves! This just the beginning. Hopefully she’d testify to whoever else are involved in the Pork Barrel scam! They all deserve to be in jail with her for taking away our hard-earned money! Shame on these people!